9 April, 2019- The eight-month old child got a new life with the help of Roth-Net endoscopy. The child swallowed the set of stapler pin which got stuck in the Esophagus (food Pipe). And the family come to know this when The child started coughing. Dr.Durga Prasad, Pediatric Gastroenterology, consultant doctor of Apollo Medics Super Specialty Hospital, and his team successfully treated the Child. When the mother came to know this, she tried to remove the pin by herself but the set of stapler pins went ahead and reached into the food pipe after that condition of the child became serious, and started bleeding from his mouth. 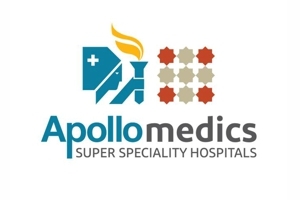 When the child was brought to Apollo Medics Super Specialty Hospital at midnight. Firstly, the location of the pin was detected with the help of X-ray, and after that the endoscopy was done, which made it clear that a set of stapler was trapped in the food pipe. The child’s condition can be judged from the fact that he was unable to drink milk. The set of stapler pin was successfully taken out with in half hour with the help of Roth-Net (which is a kind of endoscopy tool). After three hours the child was breastfed. He was kept under observation for a day and he was discharged next day.